Every industry, at some point, will experience a downturn. Those companies that strategically plan for these events, foreseen or unforeseen, are more likely to survive and thrive in a difficult market. In some respects, all industries are cyclical, differentiated only in their severity and the duration of the cycles. It is common for companies entering bankruptcy to implement retention programs for employees deemed critical to the organization’s survival through the bankruptcy process. These programs retain key talent, are approved by the bankruptcy judge, and provide security for creditors that the company’s number one asset, its people, remains in place. While this talent protection is discussed frequently in struggling companies, it is often overlooked in markets and industries on the uptick. In companies that are thriving, it is common to see incentive programs that align pay and performance, but most companies do not consider “pay for retention” when industries are flush with cash and competitors are poaching critical talent. There are several key issues, techniques, and pay philosophies that companies should consider in rebounding or high-performing industries. The key stakeholders that make corporate compensation program decisions, such as company ownership, compensation committees, and senior management teams, continue to receive strong external pressure from shareholders, proxy advisors like Institutional Shareholder Services (ISS), and shareholder activists to link compensation programs to performance. This continued pressure has driven companies to create highly-levered incentive programs that are tied to, in some circumstances, ineffective or unnecessary performance metrics. Once a covered employee, always a covered employee – A “covered employee” will now be anyone who has ever served as Chief Executive Officer, Chief Financial Officer or one of the next three most highly compensated officers starting with 2017 covered employees. Companies will want to be careful to not inadvertently bump additional officers into the “covered employee” classification with one-off bonuses or stock grants, as they will always be subject to the $1M compensation deduction limit going forward. For acquisitive organizations acquiring another publicly-traded company, the acquired public company’s covered employees would also be considered covered employees of the acquirer going forward, which will further limit the surviving public company’s tax deduction. Positive discretion may be back – Under the previous terms of Section 162(m), a compensation committee was not allowed to exercise positive discretion to adjust payouts of performance incentive programs for fear of negating the deductibility of compensation over the $1M limit (negative discretion has always been permitted). With the removal of the performance-based exception, compensation committees may consider utilizing positive discretion within the company’s bonus and long-term incentive programs. Compensation committees may now consider differentiating themselves in the market by applying positive discretion in determining incentive payouts for select employees when performance metrics are not met (whether due to extenuating circumstances, or otherwise). While this may seem unreasonable to some shareholders and proxy advisors, and a strong disclosure justifying the decision may be needed, it provides the compensation committee with another useful tool when retention is critical in an ultra-competitive environment. Pay for performance is here to stay – Linking incentive programs to performance metrics is here for the foreseeable future, but companies and compensation committees may now be more flexible in their use of discretion and tolerance to make market-related adjustments to their incentive programs. It is typically a best practice to establish performance metrics with proper line-of-sight to participants and allow the full performance period to play out under the plan terms (set it and forget it!). However, in cyclical markets, there is frequently a need to make interim plan adjustments, positive or negative, to account for unforeseen circumstances. Without the constraints of Section 162(m), such adjustments can now be made. Companies with publicly-traded debt are now subject to Section 162(m) – One other important change to Section 162(m) under the Tax Reform Act is that now companies with publicly-traded debt are subject to Section 162(m), when they previously were not. While this may not impact many companies when compared to the number of public companies in the United States, these companies with publicly-traded debt will now be subject to the deduction limits of Section 162(m). With the U.S. financial crisis of 2008 and the energy market crash of 2015, thousands of employees lost their jobs and much of their retirement savings in these downturns. During these crises, it was near impossible to find employment for many displaced employees, while surviving companies retained the minimum number of employees required to keep operations afloat. Retention was critical during these times, but companies also used this time to “clean house” on bloated General & Administration expenses and establish a “new norm” for operations going forward. As markets rebound, companies tend to loosen their purse strings and quickly hire talent that may or may not be the right fit for the new environment. Retention in these environments is often overlooked because of the significant amount of wealth (incentives paying out at or near maximum, stock awards sharply increasing in value, etc.) that employees receive in a climbing market. However, if companies are not strategic in their hiring as well as their compensation program design, they will not be able to sustain or retain the critical talent they spent so much time hiring on the ride to the top. 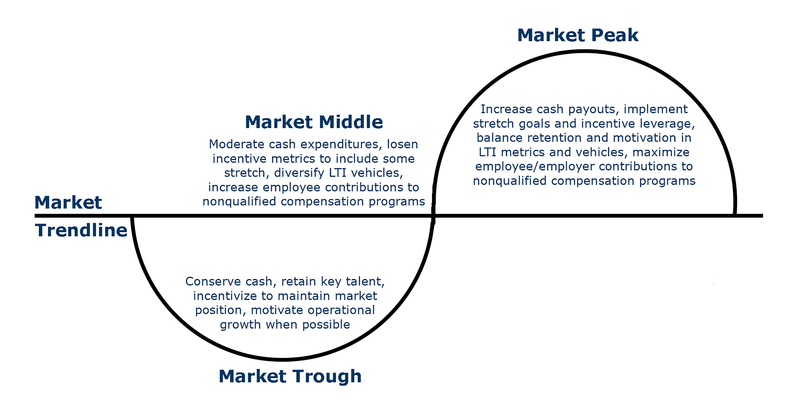 The following chart on market cycles displays typical attributes of compensation programs in market troughs, midpoints, and peaks. It is critical to understand what other companies are doing in these cycles to create customized and competitive compensation programs. Most companies have a compensation philosophy, whether it is a stated formal policy or an informal philosophy, that is utilized to make compensation decisions. This philosophy many times is different at different levels in the organization and will evolve over time based on market factors, individual leadership influences, and internal factors. The key to an established compensation philosophy is to apply it consistently. The concept of “buying” talent on the market when it is a critical position or required to support the company’s strategic initiative is valuable but should be used sparingly. There will always be competitors that may overpay to obtain a valued employee, but constantly chasing the market rather than sticking to the company’s compensation philosophy will only create problems over the long-term. Some attrition to overpaying competitors is healthy and should be expected. Using an established compensation philosophy as guardrails will ensure alignment with the compensation programs in place, allows the company to maximize budgets for the talent needed going forward and provides retention of the key talent in place. The Tax Cuts and Jobs Act (the Act) is the most significant change to the U.S. tax law since 1986. Although much of the focus is on “bigger ticket” items, such as moving to a more territorial-type tax system and taxation of “pass-through” entities, the Act contains numerous compensation and benefit provisions and considerations which should not be overlooked. Alvarez & Marsal’s Compensation and Benefits Practice recently released its 2018 study on compensation practices in the oil and gas oilfield services (OFS) industry. Alvarez & Marsal’s Executive Compensation and Benefits Practice recently released its 2017 study on compensation practices in the oil and gas exploration and production (E&P) industry. Our study analyzed the total value of CEO and CFO compensation packages, annual and long-term incentive pay practices, and the prevalence and value of change in control benefits to which these executives are entitled.